I’ve been contemplating writing a memoir, and mulling over a number of angles that might be of interest. I’m pretty sure, folks won’t be interested in the blow-by-blow description of the past 64 years. To start, I’ll impart some insights about what I’ve learned about my 2013 attitude-altering death-bed experience. Over the weekend, my next door neighbor and avid baseball fan organized a community trip to see if the Rockies could sweep the Giants. His buddy, an even bigger Giants fan, came out from San Francisco to see watch the four-game home stand. He’s a 75-year old guy, and constantly tethered to his iPad and iPhone, particularly when it comes to following the latest about baseball and the Giants. He’s in fantasy baseball, which is a partial explanation. I was in a fantasy league for a few years in Wyoming when all the statistics were figured out by hand. Being terrible at math, I think I kept myself out of the running by not figuring out ERA, WHIP and other obscure baseball numbers correctly. Back then, the most current baseball news was in the morning paper the next day. Flash forward to the 1990s, I joined a fantasy league in Boulder following the voter approval of the no smoking indoors law. The treasurer of the local PAC and one of the main volunteers also happened to be big baseball fans. Their league, the Baseball Buttheads, needed another team and I agreed to join. Early on, the league was very social with an annual ‘live’ draft of players. My team was called the “Yangs.” The name was derived from Star Trek episode #52 – The Omega Glory. The league met weekly at Potter’s Bar, then Dolan’s. Team owners traded players, talked baseball while enjoying each other’s company. The league organized field trips to Las Vegas which also were fun for sports fans since we spent quite a bit of time in the sports book watching games on the huge TV screens. Eventually, technology took over fantasy sports and the league became disconnected. People, died, moved or generally lost interest since the core group had dissipated. Anyway, this San Francisco guy watches the game live and listens to the play-by-play from announcer Jon Miller. This particular day, it was hot, no clouds or breeze. Most of us in our party had to take a break and get out of the sun. At the end of the game, our Giants fanatic is no place to be found. His phone was dead and he dropped off the face of the earth, only to resurface in Boulder after a missing person report filed. If you can’t get disconnected, generate some hard copy. 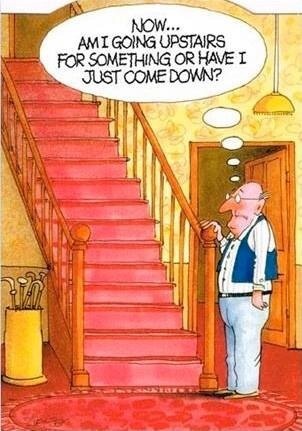 As for myself, I’m one of the tethered old guys. Travel schedules are in apps, boarding passes are in apps. I’ll be writing down basic information and keep a few phone numbers in my wallet. There are no pay phones around anymore, but most everyone has a cell phone. I haven’t asked anyone if could use their phone before. My guess there would be push back for one reason or another. I’ve been asked to make a phone call for a stranger and obliged. I used to think hard copy would clutter up the world and everything would be digitized by now. I’ve been sorting through my stuff and it’s more like rearranging the deck chairs on the Titanic. I used to think hard copy would clutter up the world and everything would be digitized by now. Turns out, that’s not really the case. There will be plenty of hard copy carrying forth into the future. Lot’s of history is “preserved” that way. I’m testament to that and sorting through boxes of papers and artifacts from my previous lives. I don’t know why I’ve held on to this stuff for so long. Don’t be surprised if you get a mysterious envelope filled with some tangible tie between us. The main reason I like making historic documentaries is the research. I’ve gotten to know my way around the state of Wyoming archives, on three projects, most recently one about modern expressionism in Wyoming. I like handling old photographs and learning about things past and assembling it all into a story about how the past informs the present. I had the huge 80gb iPod. It will soon be a relic. A few years ago when iPods came out, I early-adopted one of the huge 80 gigabyte models. Back in the days of cassettes, the rage was compiling a variety of music mixes on tape from LP vinyl records.We used to borrow each others albums and copy them for our own collections. Not only had I accumulated vinyl, cassette tape music mixes, but also started buying CDs. The iPod was supposed to revolutionize music storage. That it did, but they also sterilized memory making. A friend of mine posted on facebook recently about some problem he was having with his iPod hard drive – we have the same model – about cracking the case to get at it and the battery. Backing up information continues to be a headache, not to mention batteries going dead. There’s a company that makes an adapter to replace the hard drives with high capacity SD cards, which is a pretty good idea. I’m looking into bumping mine up to 256GB. My turntable still plays records, but I got rid of all of them in favor of CDs. My neighbor still has some discs to spin. 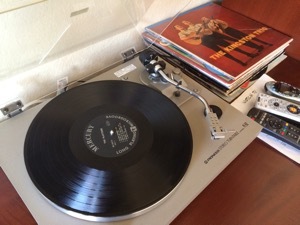 Gone are the days of turntables, memorable scratches on certain songs, beer-stained 8-track labels, the residual aroma of pot on double album jackets. They take up space, but no fear of loss due to battery failure of out-of-date operating systems. Kids must be learning different things in school. Metaphors must be changing, too, with way fewer industrial references. I don’t think talkative people sound like broken records, or those with disagreements are not on the same wavelength. There are still some items that have the human touch, including my Carhartts made in Mexico. Carhartt jeans are still inspected by people, including these three in a factory in Mexico. They add that personal touch. I put on a new pair of jeans the other day and there were these paper inspection labels in the pockets. We’re led to believe that everything is automated and made by high tech machines. Not only were my trousers inspected three times, but one of the inspectors saved on paper by changing their ID number using a Magic Marker. I don’t know what I expected the future to be like by now. The Jetsons TV family was the view of a typical 1960s family if portrayed in the distant future. The family traveled around in hover craft, their house was cleaned by a robot named Rosie. George worked at the Spacely Sprockets office, Jane puttered around the house, Judy was in high school and Elroy was in elementary school. Middle class and All-American for the future as envisioned in the early 1960s, which was the same present portrayed in Leave it to Beaver. For 99 percent of us, we did become mass society – most everyone has a TV, microwave oven, internal combustion engine car. Regardless, it’s good to know there are humans involved in the manufacturing quality control. There’s plenty of esoteria that goes into making smart refrigerators and smart coffee pots, but the basic purposes remain the same – keep food cold and water hot. Picard manages to save his hard copy family album. After the Star Ship Enterprise blew up, Picard was able to retrieve his family album as he took over the Star Fleet command. Remember “Star Trek Generations”, the movie set in the 25th century when the Star Ship Enterprise is destroyed? Captain Kirk turns the keys over to Jean Luc Picard. Some of the photos and papers dated back to the 18th century. If it was digitized, the electromagnetic pulse would have wiped the disc clean. Hard copy isn’t safe from disaster. The library at Alexandria was the book repository for the world at that time and it was supposedly destroyed by a big fire – no copies left of any of that. 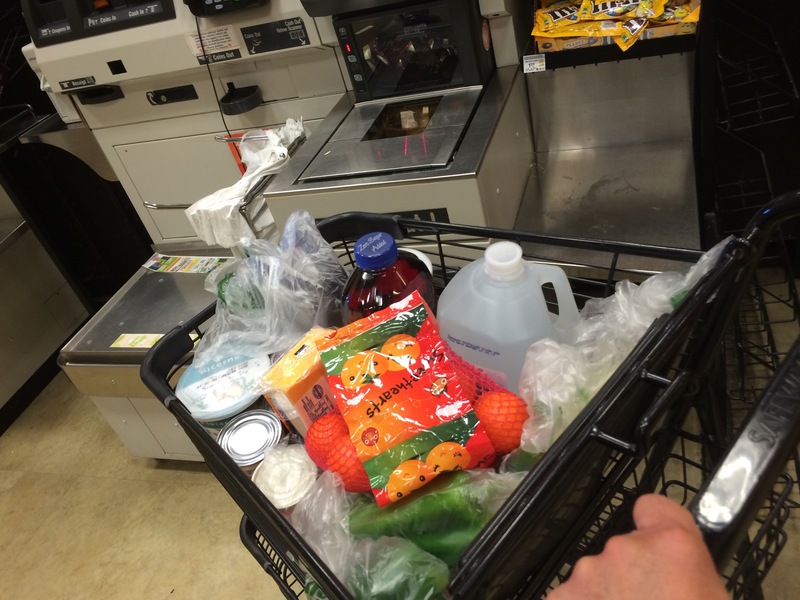 Grocery store plastic bags cost a dime in Boulder, Colorado. I tossed out the trash today. It was in a plastic bag. I always dump it out so the organics will deteriorate and not leave any evidence of my diet in the landfill. My neighbors use those nuclear war-proof bags with the draw strings. Archaeologists and paleontologists of the future will have a pretty good idea about our 21st century culture. 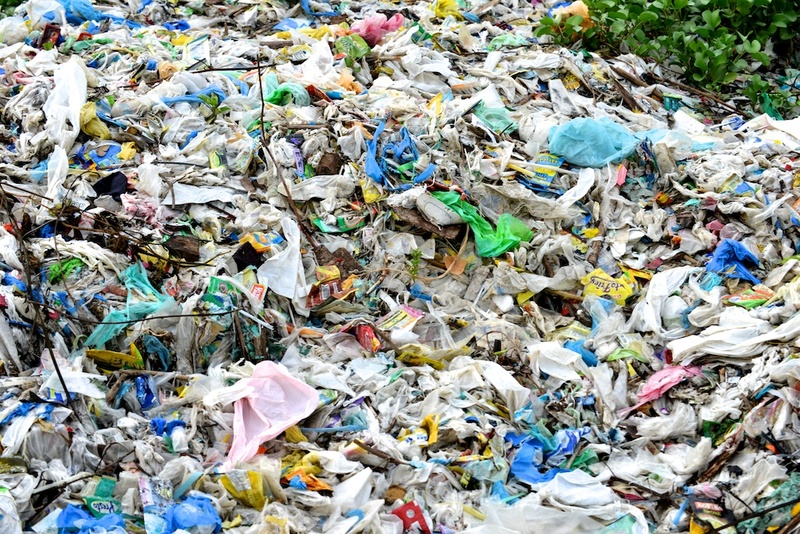 Our ancestors will determine that we inhabitants revered our detritus as evidenced by the stockpiles of leftover food, old papers and various containers hidden in large altars excavated into hill sides surrounding urban areas. I hope they have fun looking through my boxes. After visiting Graceland a couple times, I’m convinced that the only people who have any business holding on to their keepsakes are famous people. I still know the difference between coming and going but have to work harder on names. The actor Alan Arkin came to the Boulder International Film Festival a few years ago. During his interview, he said that he was becoming more forgetful, and proud of it, which got a laugh from the largely Baby Boomer audience. I, too, have noticed that I have to think harder. Not because I can’t solve problems, but because I remember the wrong stuff. I’ve always been a trivia buff and sometimes wish I could dump some of that gunk out of my head. 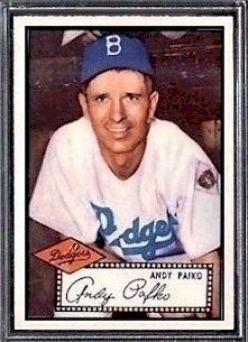 I can remember that card #1 of the 1952 Topps baseball card set is Andy Pafko, but I have to keep repeating to myself that I need to buy a new flapper for the toilet tank. My long term memory is still sharp, but I wish I could purge my brain of some of it. Add to that, no less than 20 flapper choices ranging in price from $6 to $20! I spent way too much time at the hardware store today. 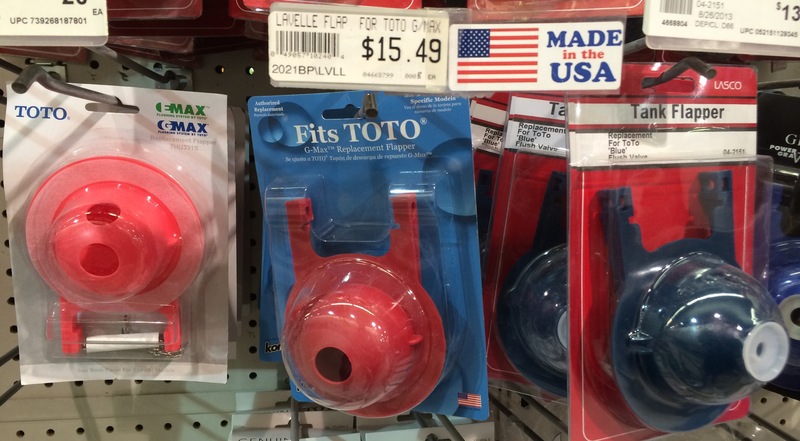 I settled on the TOTO for $15 – made in the USA, USA, USA. 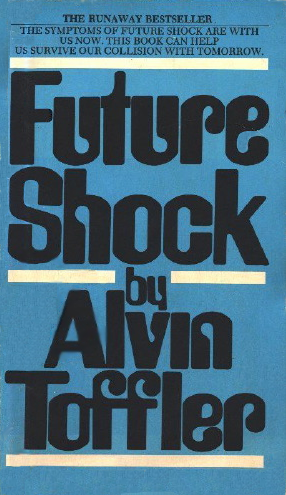 Alvin Toffler wrote “Future Shock” in 1970. The book is about personal perceptions of “too much change in too short a period of time”. Alvin Toffler’s “Future Shock” came out when I was in high school. It was quite prophetic. My too-many-flappers conundrum is future shock come to pass and I notice I spend too much brain power on cluttered decisions like this. “There have been a lot of advancements over the years,” the green – vested McGuckin plumbing department guy said of his collection of rubber plugs to keep toilet tanks full of water until the next flush. I had too many flapper choices, but the one I bought, did the trick. Add unexpected flapperology lessons to my lack of motivation and general lethargy arising from my illness recovery over the past few months and it’s a double whammy. As a hedge against my future shock, folks encouraged me to arrange the clutter by writing lists for this and that. I began to jot things down in a calendar book like meetings and dentist appointments appointments, but write a list? Will someone find me a pen? 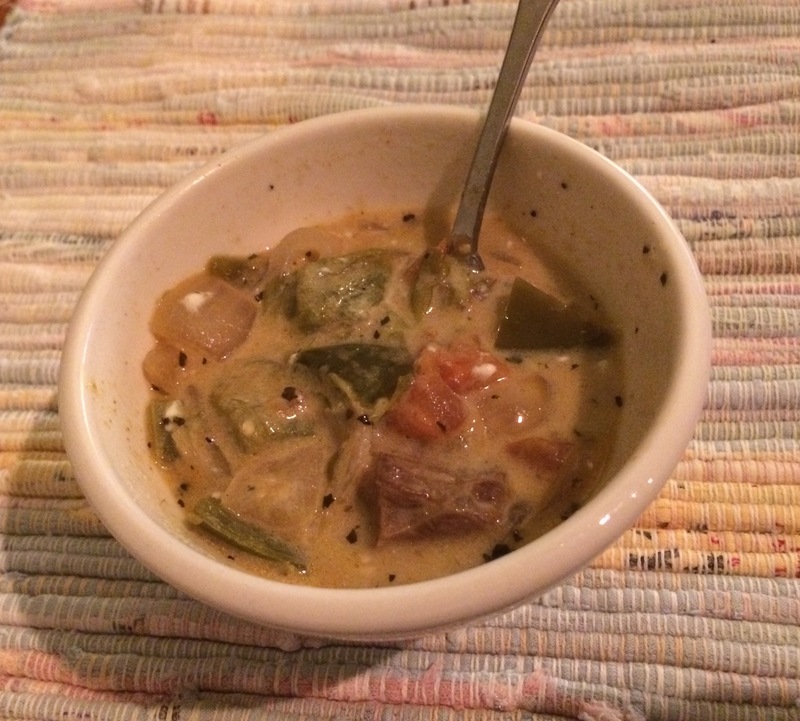 My first batch of green chili turned out, thanks to the readily available fresh veggies. I started cooking more food from scratch and use recipes from allrecipes.com mostly because the mobile phone app works pretty well in the food store, with or without WiFi. The parts list is at my fingertips. While reading recipes, I could tell the older ones because they called for x-number of cans – Ortega green chiles. The food stores stock lots of product that didn’t used to be offered. Safeway now offers peppers galore – pablano, habanero, banana, orange ones, yellow ones, red ones, those long slender ones you get on Chicago dogs. The chili was good, but turned out a little spicier than I thought and I’ll tweak the recipe for the faint of heart. I used to improvise a lot, but have since learned that there’s a lot of chemistry involved in cooking, and not everything has to have tomato sauce in it. I’ve not only started keeping a virtual recipe box, I keep my contact list up to date to help me remember people. I’m still pretty good with names, but I have to repeat them to myself more than in the past. When I see people after a year, I can remember when we met, where we met, what they do for work. Sometimes, sometimes not, the name will come to me. I learned from my nonprofit development director days that there are very expensive computer programs written to keep track of donors and prospects. I use my phone contact list to remind me about people. When I go places now, I have to study who may be there. I could just ask people their name, but that’s no fun. My neighbor, Henry, says that proper name memory is the first to go – something to do with the hippocampus. That’s a bit reassuring. Jerry Seinfeld had trouble remembering his girl friend’s name that rhymes with a female body part. This reminds me of the Seinfeld episode when Jerry can’t remember his girlfriend’s name that rhymes with a part of the female anatomy. There’s an Alzheimer’s disease ad playing on TV about a husband that finds his wife’s car keys in the fridge. So far, I haven’t done anything like that, but then again, I’ve been misplacing things for years like my wallet, phone, coats. I always have gotten everything back, though. When that luck runs out, I should start worrying. In the meantime, I’ll just go with my future shock flow and keep absorbing baseball trivia, keep my choices simple and remember names by way of mnemonic devices.